Volunteers play an integral role in making the Habitat 500 a successful event. Riders raise funds for the construction of Habitat for Humanity homes as well as build awareness and support for the mission of Habitat for Humanity. Through your contribution of volunteer support for the ride, you’re helping to build strength, stability, and self-reliance through shelter for Habitat homeowners across Minnesota, the United States, and around the world. Each year, volunteers include join riders for the week, sleeping in overnight hosts’ gyms or outside in tents and eating breakfast and dinner with them each day. The Habitat 500 counts on volunteers to help the Ride go smoothly each year! You can also sign up as a general volunteer and have us put you where we most need! All volunteers should be available for orientation on July 13th, then for the week to volunteer (July 14-19). ​Please email habitat500@hfhmn.org for more information about volunteer opportunities! NEW! 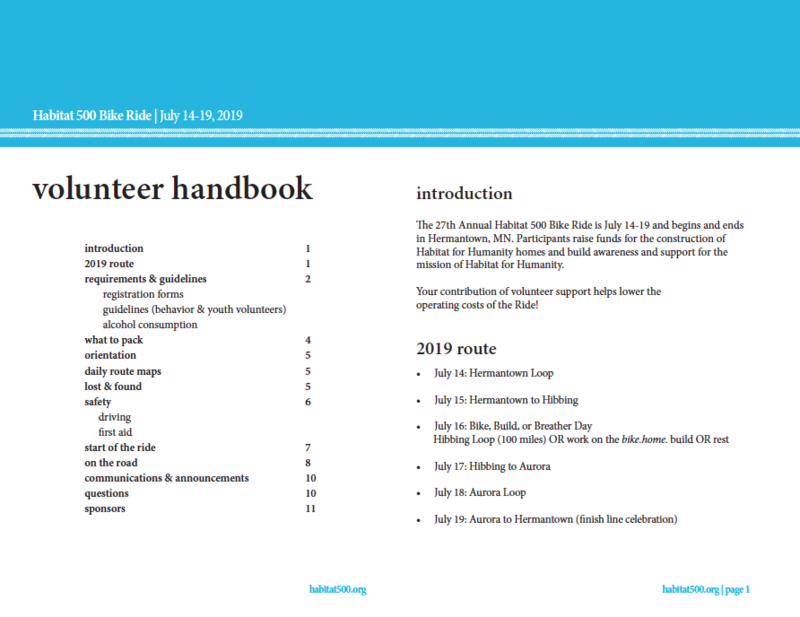 See the 2019 Volunteer Handbook below. All volunteers should read the entire handbook before the Ride. Web: Sign up for our monthly newsletter!